Most streams that feed into South Dakota’s Big Sioux River exceed regulatory limits for E. coli bacteria concentration. Because removing E. coli from the river itself is far more challenging, remediation efforts generally focus on filtering the bacteria from stormwater runoff while still on land. Alex Demas/U.S. Geological Survey. 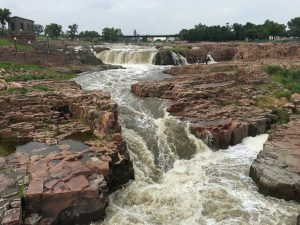 In the watershed of the Big Sioux River, a 675-km-long (420-mi-long) tributary of the Mississippi, the South Dakota Department of Environment and Natural Resources reports that nearly all streams exceed regulatory limits for Escherichia coli bacteria. After a summer storm, runoff drives E. coli levels in some streams to reach as high as 2000 colony-forming units (cfu) per 100 mL, placing nearby communities at heightened risk for illnesses. A researcher from South Dakota State University (SDSU; Brookings) has demonstrated that the best solutions sometimes come from unlikely places. 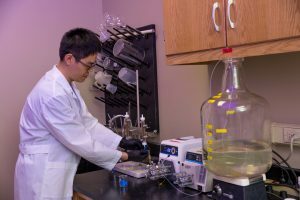 Sourcing metal wastes from a machine shop near campus, then-graduate student Peng Dai discovered that simple steel chips could remove up to 99% of E. coli from simulated stormwater runoff. Dai, who earned his master’s degree in environmental engineering this spring, was inspired by the research of a former SDSU student who had repurposed common mining industry byproducts as stormwater filtration media. With the support of two local water districts and the U.S. Department of Transportation Mountain-Plains Consortium (Fargo, N.D.), Dai examined whether discarded steel chips could attract and filter E. coli bacteria from stormwater runoff under laboratory conditions. Dai studied steel chips ranging in length from 0.5 to 8 mm (0.02 to 0.3 in). To simulate a broad range of real-life runoff, he gathered water samples of low to extremely high E. coli concentrations – 10 cfu/100 mL to 1 million cfu/100 mL. Samples ranged in pH values between 5, 7, and 9. Chips were placed in a glass column and exposed to continuous and intermittent bursts of the runoff. “I controlled the nutrient levels in the simulated stormwater so that the E. coli survived but did not multiply,” Dai explained. Contact times between the steel chips and stormwater were also controlled, with trials as short as 5 minutes or as long as 20 minutes. South Dakota State University (Brookings) researcher Peng Dai studied the conditions that most strongly support steel’s ability to attract and remove E. coli bacteria from stormwater runoff. He found that using small steel chips as a filtration medium with long contact times could remove nearly 99% of E. coli bacteria regardless of its concentration. South Dakota State University. Across all trials, small-column testing showed the steel chips could remove anywhere from 85 to 98% of E. coli bacteria from the simulated runoff. These results were consistent during both continuous and intermittent storm-event simulations and for all concentrations of E. coli. The best results involved smaller steel chips measuring 0.5 to 2 mm (0.02 to 0.08 in) in length, longer contact times between the chips and the runoff, and lower pH balances. Under those conditions, Dai was reliably able to remove nearly 99% of E. coli bacteria. Dai told New Atlas that the steel chips are so effective because of the electro-chemical reactions at play between the two substances. Steel releases ferrous and ferric ions that oxidize the cell membranes of E. coli bacteria when the two come into contact, effectively destroying the micro-organism, he explained. An SDSU press release notes that another graduate student in the university’s environmental engineering department plans to pick up where Dai left off. That student is creating a stormwater runoff filter that uses steel chips as a filtration medium. This summer, the filter will be installed at an inlet where stormwater from a 4-ha (10-ac) residential area near the SDSU campus drains into a retention pond for pilot-scale testing under real-world conditions. The hope is to bring together three “generations” of SDSU research for a groundbreaking solution capable of keeping E. coli out of the Big Sioux River.